Every dog has its day, we're told, even presidents who, in the hierarchy of things, rank lower than dogs if you can believe their approval ratings. Washington's First Hatchet Job. An invention, of course. It's not much of a job. 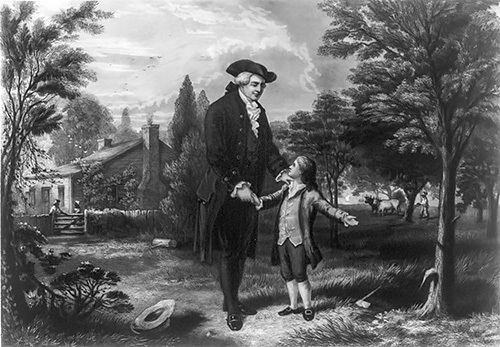 Washington, who was childless and therefore in no danger of establishing a monarchy, thought he'd only hold the job for a couple of years to establish its legitimacy but ended up serving two terms because, well, even then it took a long time to get anything done in the nation's capitol. And you can see what it did to Lincoln in this series of chronological photographs. Lincoln had the misfortune of having his portrait photographed rather than painted in an era when the camera had a much harder time lying than it does now. Presidents' Day is an ambiguous holiday (but a federal one and one we plan to enjoy as soon as we wrap this little treatise up), designed to make a three-day weekend in February out of Washington's birthday (on which it never falls) and for good measure shoe-horning Lincoln into the deal (though his birthday was never a federal holiday). Which has prompted some generous souls to suggest the apostrophe extends to anyone who served in the office. Some of their barks were, of course, worse than their bites. And vice versa. But since everyone in this democracy, including those who didn't vote, is an expert on the presidency, how you draw that list up depends on what you're drinking. Or if you're drinking at all. We'd only hazard to warn you off the Kool-Aid. Consider that a public service announcement. And public service announcements are the only reason we bother you on federal holidays (although we did toss out a few table scraps earlier today since we were out of bed). So pity the president. Everyone of those other miserable creatures who took the oath immediately became the object of a stream of them. Not even an undocumented worker would take that job.